Whether adding a pop of shine to your home interior or enlivening your backyard garden; the presence of flowers can’t be looked down. Although there are a vast variety of floral inspirations, the homeowners need to be fully conscientious when it comes to altering your tiresome house into a flamboyantly eye-catching dwelling. Learn more about these 180 types of flowers you might go for your flower decoration ideas. A purple flower represents three symbols – tradition, dignity, and success. The magical combination of red and blue exudes the endless charm and glamour uneasy to be forgotten. It also has other meanings which tell the people about adoration and admiration. 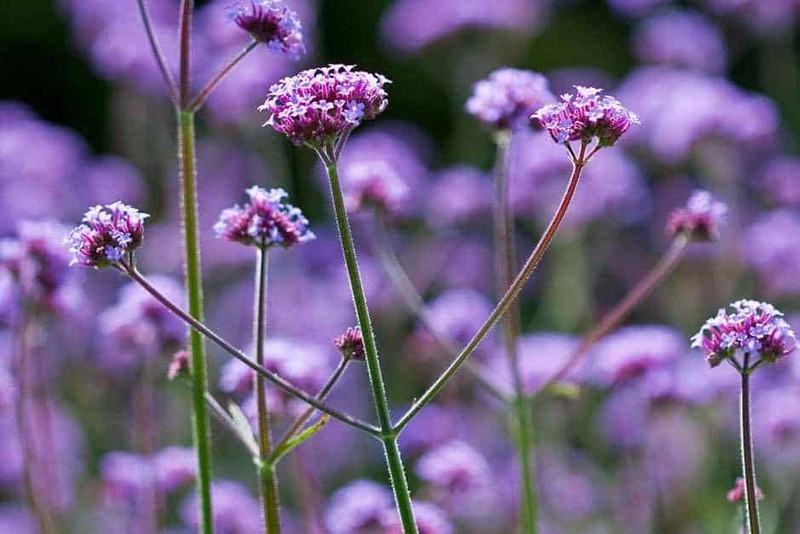 Verbena bonariensis better known as Tall Verbena could be described as long-blooming lilac flowers bundled in a group. Originating from South America, the stupendous perennial has 6-feet-tall svelte stems and ovate leaves with a toothed margin. The enchanting flowers usually bloom in the mid-summer. It’s pretty significant to determine the medium to grow the Verbena. It requires soil which is mostly well-drained and partial shade. To maintain the regular humidity, watering the plant twice a day is definitely great. Unfortunately, it’s prone to powdery mildew and slug attack. Planting the aromatic lavender to grace the hedgerows sounds impeccable. The floral plant also known as Lavendula consists of sets of tubular flowers with long green stems and densely clustered, tiny, and dark lush leaves. The blossoms truly give off distinctive smelling favored by most of the flower aficionados. The fragrant shrubs are always lovely. 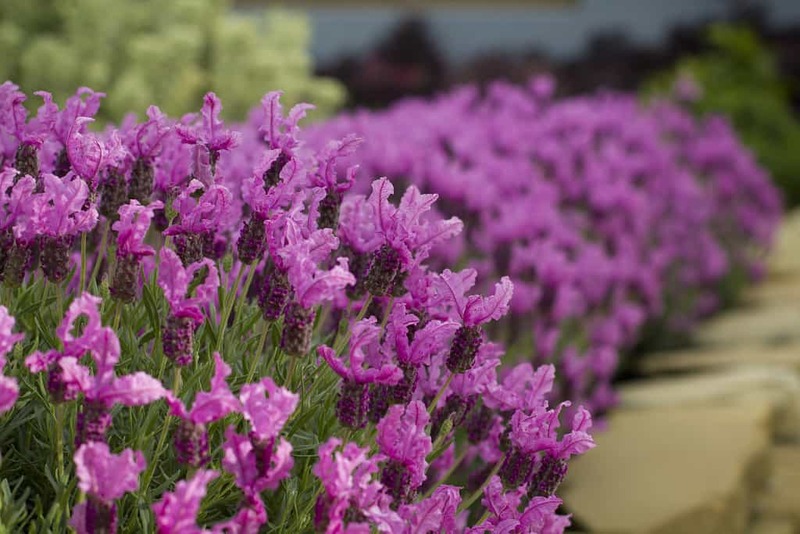 Native to the Mediterranean countries and East Africa, Lavender is not only used to adorn the landscape but also for a commercial purpose. The dried leaves and flowers are usually utilized for culinary herbs and essential oils. Clematis pops against other species under the family of Ranunculaceae. The buttercup flower plants commonly known as the queen of climbers come with an immense blossom comprising of six to seven petals varying in shape. The vines mostly hanging up and reaching the top are ideal to be grown on the patio as well as the small garden. 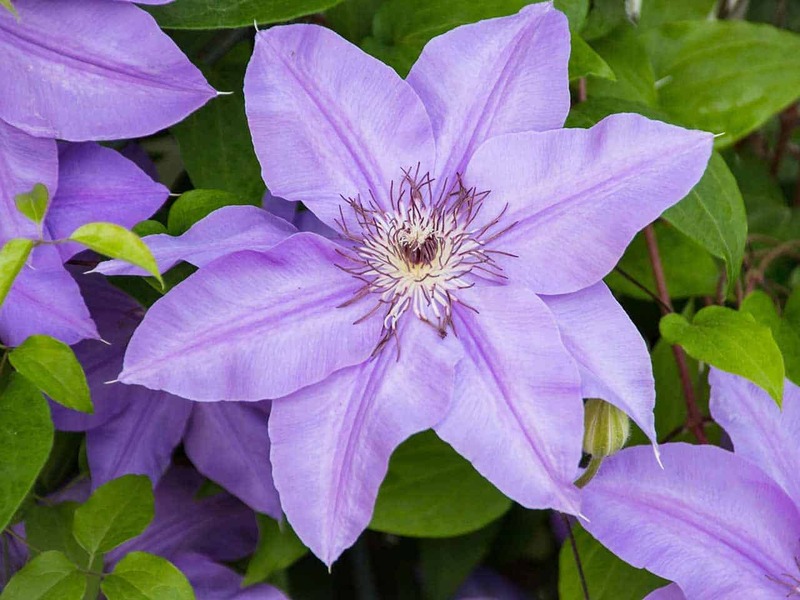 Clematis has variations that include Henry, Jackmanii, and General Sikorski. Apart from this, the woody climbing lianas can thrive well in the cool, damp surroundings under the full sun. They are mostly found in the Northern part of the world relatively temperate. 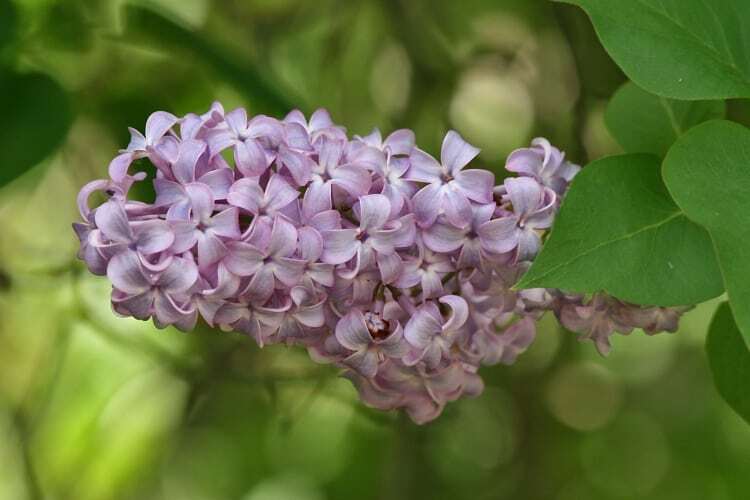 Syringa vulgaris or known as Lilac is a kind of flowering plant of which leaves are substantial and deciduous. Originating from the peninsula of Balkan, the shrub often generates secondary shoots called suckers. The Lilac’s rind varies from grey to brown. Meanwhile, the blossom owns a tubular base allowing the people easily to fall in love. Not only does the pale purple flower carry attractive appearance but it also has a sweet fragrance. Often blooming during early summer, the ornamental plant is frequently grown both in the park and garden. It doesn’t require specific upkeep – the only problem is no other than the attack of powdery mildew. 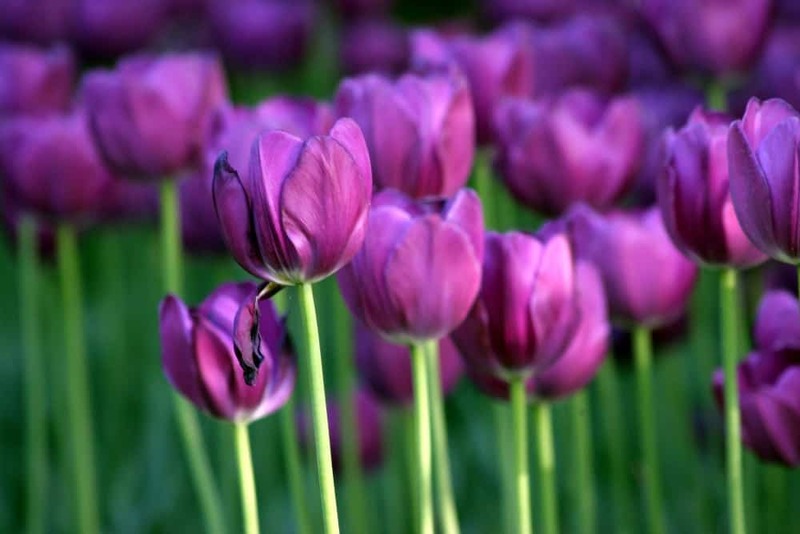 Among tulip multiplicities, the purple variety remains to stand out in your backyard garden. Just like the rest, this fine-looking native to Central Asia has vast, symmetric petals. The perennial which mostly blooms during the spring are best cultivated within cool, temperate climate. Additionally, this plant surely needs right maintenance. In spite of the correct raising, the purple tulip is basically easy to grow under either full sun or partial shade. If you are about to multiply this species, it is pretty important to check out the flower bulb. For the amazing result, we recommend you to pick the largest one. The future plant indeed has stronger stems with more flowers. A yellow flower is one of the types of flowers playing a major role to brighten a space as well as cheering up the crestfallen individuals. The vivid blossom is always associated with joy. It’s no wonder; presenting it to the others has a handful of purposes such as to strengthen the friendship bond, and to show compassion, pride, and truth. 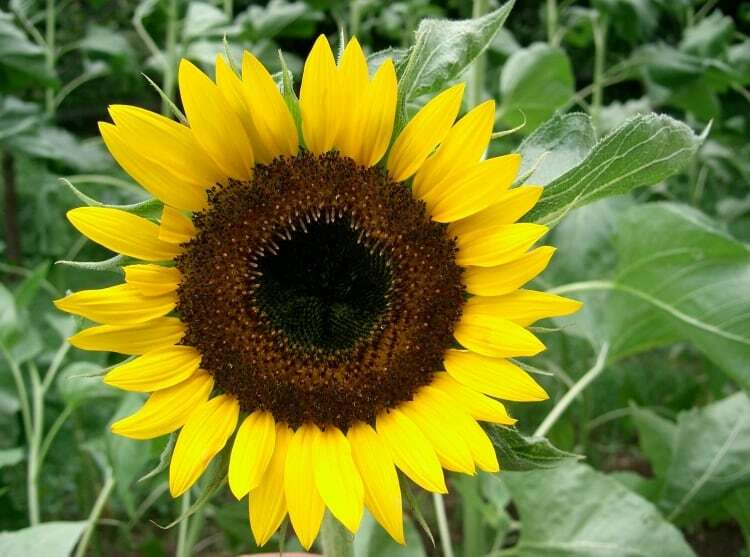 The vibe of Helianthus annuus or sunflower is undeniably appealing to everyone. Once the end of summer comes, the perennial species wide-openly blooms. The sun-like flower with a large head can be found anywhere in the world as long as the climate is temperate and tropical. Yet, the beautiful plant loves sitting alongside moist area. In addition to the damp surroundings, the sunflower grows very well under the full sun. The sun exposure is significant to the perennial. It requires at least 5 hours for the plant to absorb the sunlight. Asteraceae flowering plants are comprised of some species. 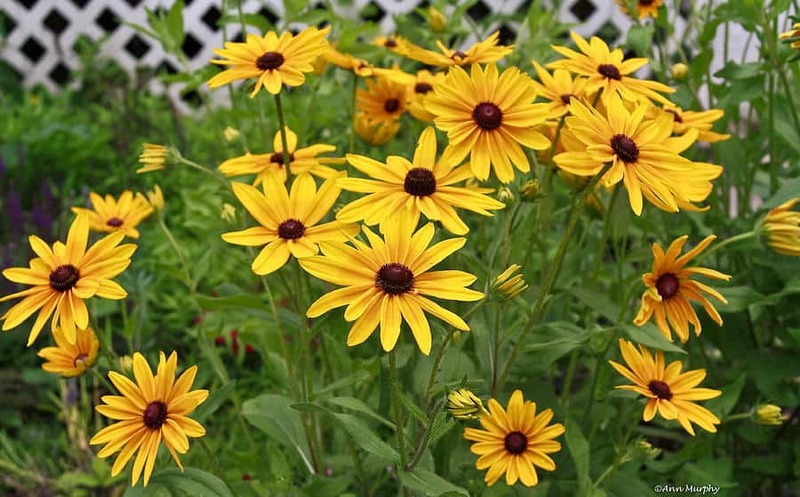 Among all, the yellow daisy keeps standing out making your cute garden more vibrant. Flourishing well in both tropical and subtropical regions, the blossom is made up of dark yellow petals with a brown center. Its cylindrical woody stem uniquely has glandular hairs. Is it easy to grow this sweet lady? Yes, definitely. With the right climate and enough moisture, the yellowish blossom can develop well. For the soil selection, apply the well-drained one. Although the daffodil mostly inhabiting meadows and rocky land surface deserves to be dubbed wild shrub, still, the enchanting plant definitely adds grace to your home. The Narcissus (another name of daffodil) often comes into bud with 6 large yellowish petals during the late winter and early spring as well. Caring the plants has never been tough. 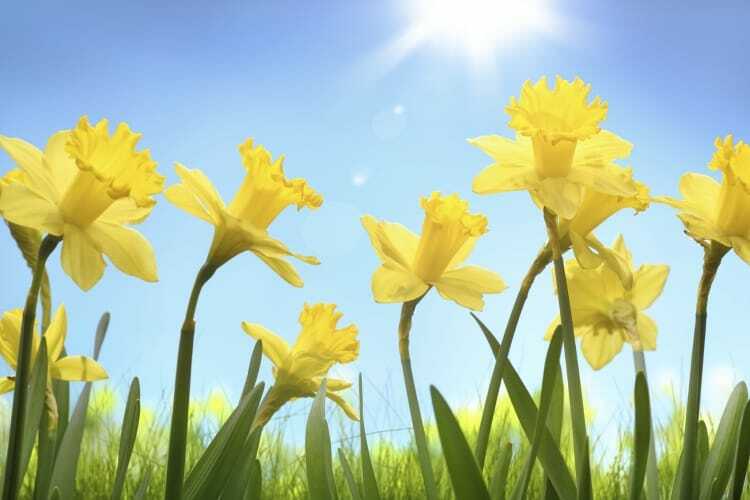 Either the partial shade or full sun, the daffodil is in the significant progress – before growing, make sure to provide well-dried soil. The best time for the flower cultivation is in early summer and fall. 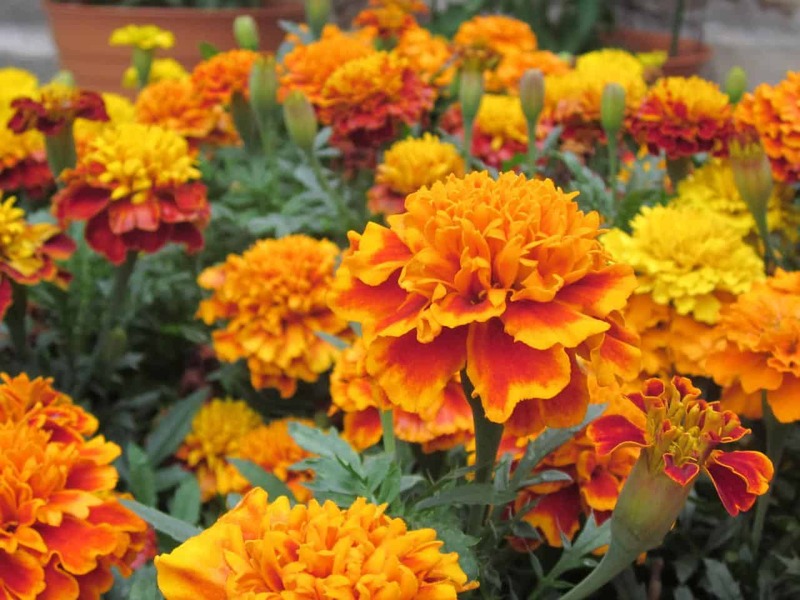 To touch up the home borders, there is nothing more relevant other than growing the marigold or recognized as Tagetes. Having this herbaceous plant has a lot of benefits – it is undoubtedly easy to grow, loves full sun exposure, and handy for the natural pesticide. Although it’s scattered across the globe, the lady originates from America. Growing Tagetes is such an effortless task. You need to spread the seeds on the moist ground and let them under the sun. For the fertilizer, you can take advantage of used worm tea. No one is able to deny the elegance of yellow butterfly bush or Buddleia davidii. The flowering shrub releasing nice smelling is compatible with your summer garden. The sun gold type has a thick green stem loaded with tiny flower colonies. True to its name, the fragrant plant is favored by butterflies as it provides an abundance of tasty nectar. To avoid blowing over in the wind, it’s pretty vital to prune the hybrids. The annual pruning helps to increase the number of roots so that the stem can stand firmer. To accentuate your garden and home interior, jamming the spaces with black flowers is such a flawless idea. In addition, the darkish blossoms literally improve the dramatic touch on your floral display. Despite their look associated with the mystical impression, black flowers symbolize rejuvenation and rebirth. 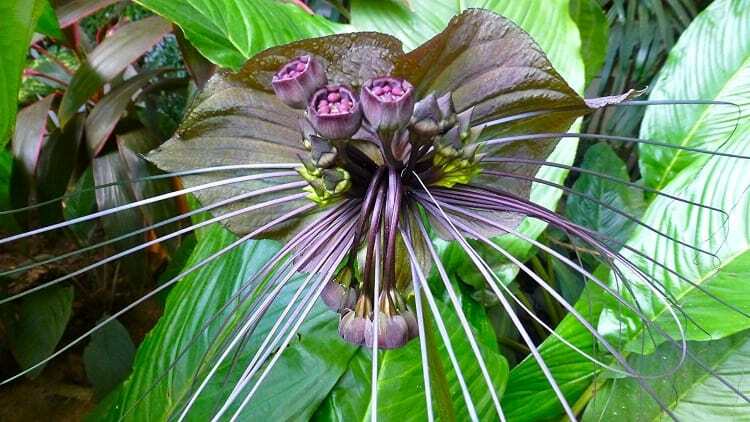 The best description of a bat flower or Tacca chantieri would be eerie and extraordinary. However, the bat-shaped shrub belonging to the family of Dioscoreaceae sends out perky impression, fitting for those looking for sophistication in gardening. Enticingly, this flower has whiskers spanning up to 28 inches. What an interesting fact! As the bat flower is native to South East Asia, its growth requires tropical climate. Unlike other typical plants having a great interest in the full sun; Ms. Tacca prefers sitting in the shady spot with well-drained soil. 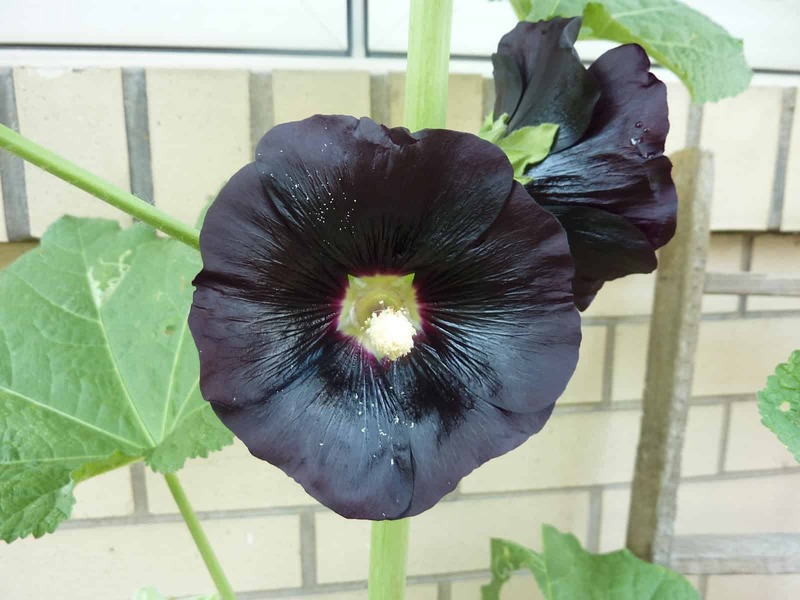 Among flower adorers, Black Magic Hollyhock has special meanings – wealth and fertility. The perennial often used in the worldwide celebrations is originally from the Mediterranean country. Back in the day, this entrancing flower sprang up in the medieval garden. In other words, Alcea rosea deeply is linked with the Roman Empire. You can begin the growing step by layering the flower seeds with moist soil under the day temperature of 20C. Besides, it is not in need of full sun and tropical atmosphere. 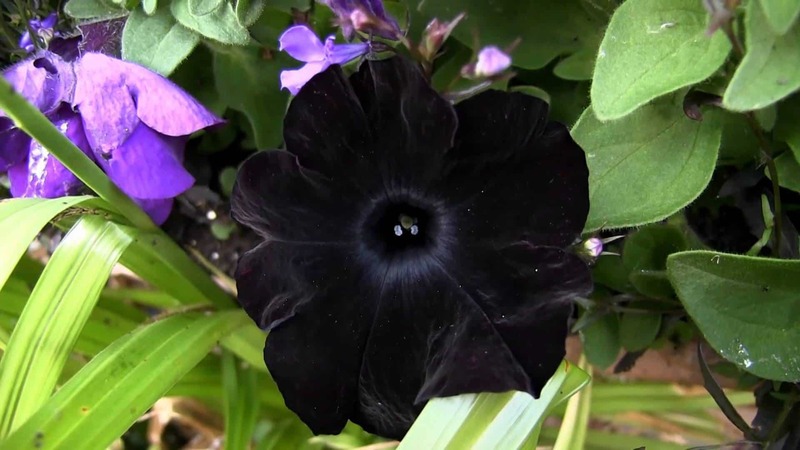 Opting for the charming black velvet petunia to adorn your hidden home paradise is nothing yet exceptional. The feature of this perennial is absolutely its raven-black appearance. Additionally, it pops against the shade as well as mingling in tune with the lush surroundings you are unable to imagine. Making this sweet black lady develop elegantly needs a little effort. Prepare mulch and humid soil then place them in a pot. Plant the flower and locate it in the shady area. Although this flower consisting of three main shades sounds colorful, black dominantly covers up the petal. Pansy has a wide range of names such as Jhonny Jump Up, tickle-my-fancy, and three faces in a hood. It is a European wildflower commonly found in the woodland and prairie, yet, this lady is nice for the floral decoration. 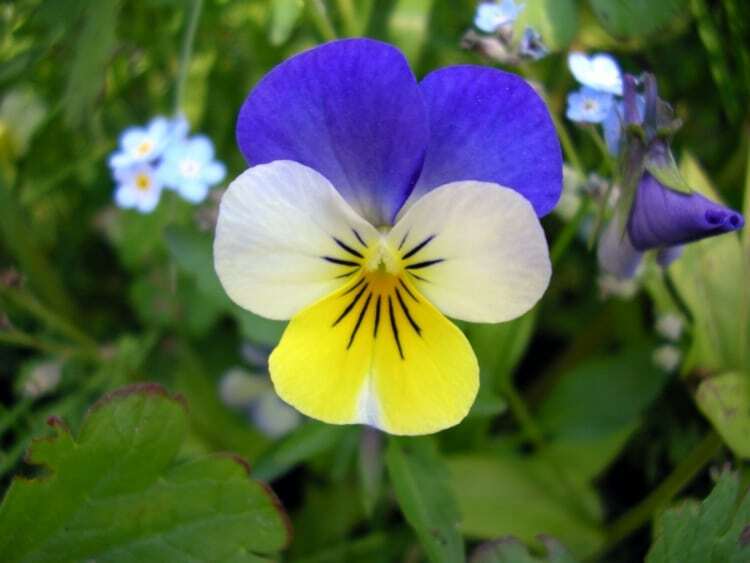 Aside from being used for garden’s ornament purpose, Viola tricolor has varied benefits regarding the health issues like asthma, whooping cough, and skin diseases. Speaking of black rose, some people might relate this exquisite lady to the world of fiction and multifarious meanings. Just like the rest of roses, the perennial owns several jet-black petals split into two dissimilar lobes. Its stems are woody and filled with a number of thorns. 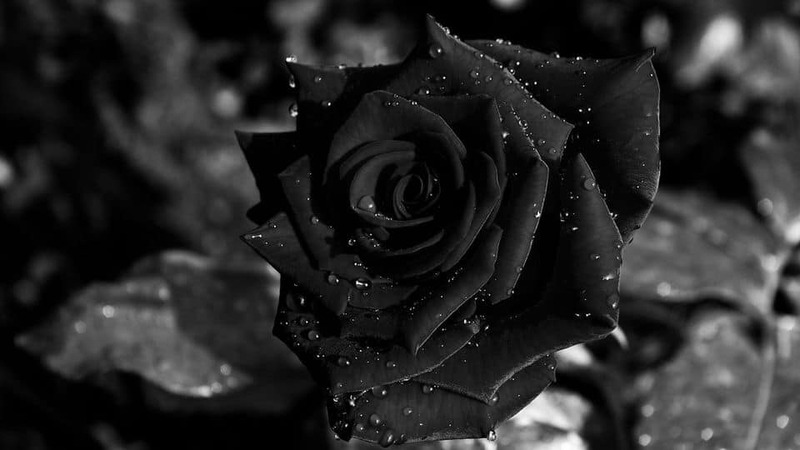 And most importantly, the black rose has attractive smelling. Planting black roses don’t require such a particular treatment. Yet, you need to look carefully at the keys in growing the rose such as organic mulch, well-drained soil, and regular pruning. The presence of orange flowers bringing some jauntiness and optimism at your home garden hides a bunch of significance. Some must consent that the essence of this bittersweet blossom has a close relation with warmth, expansion, and growth. Orange flowers are overly identical to the shade of sun. Don’t you remember that the star always pours out the grey sky after the stormy day? Likewise, they have the same charm. 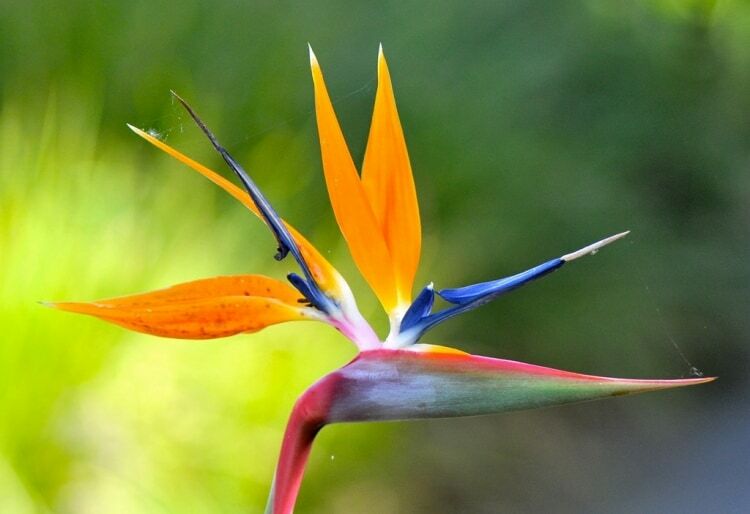 Bird of paradise or Strelitzia is one of the Australian pride delivering joy to any garden visitors. Do you know why it is called so? True to its name; this engaging bush keeps its plumed blooms roosting on the elongated greenish tinge stem, simply like a tropical bird of paradise unwinding on a tree’s branch. This bright tangerine lady even can survive in the extreme weather, be it a long drought or rimy environment. For the care and maintenance, grasping the sunny position and feeding sufficient fertilizer are the clues. The African inhabitants often call Bulbine a snake flower. Despite its quaint look, the succulent bloom of a plant remains enamoring. It distinctively has small star-shaped, cantaloupe petals and ribbed verdant leaves gripping the lower stem. The stamens produced are fluffy and yellow. And the bi-colored appearance is impressive. 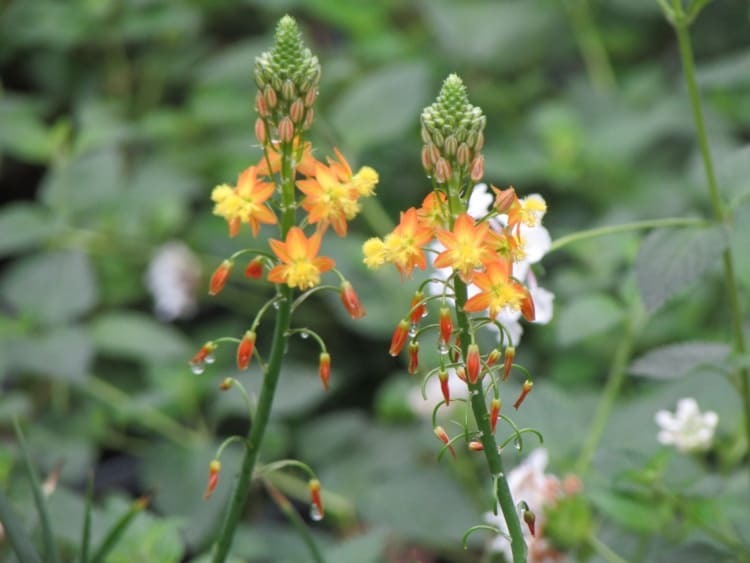 The name of Bulbine is given as this fleshy perennial is pretty similar to a bulb or onion. To grow this, it’s required to provide a land which is mostly drought-resistant. Turning your backyard into a South American garden sounds incomplete without the existence of Alstroemeria. 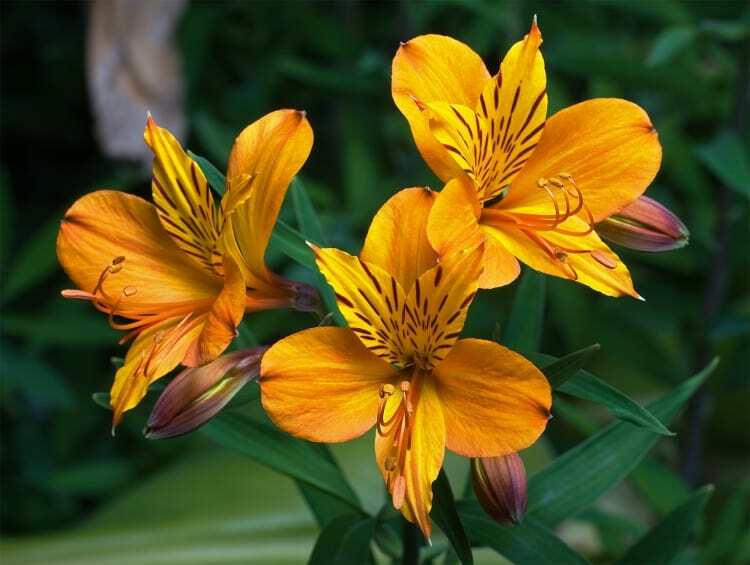 The flowering plant popularly named the Peruvian lily. The blossom has 6 5-cm-long, tangerine petals as well as curving reddish stamens attracting not only humans but also multiple insects. The adorable perennial blooming in early summer needs a bit careful care. Hence, watch the morning sunlight, mild temperature, and regular water. 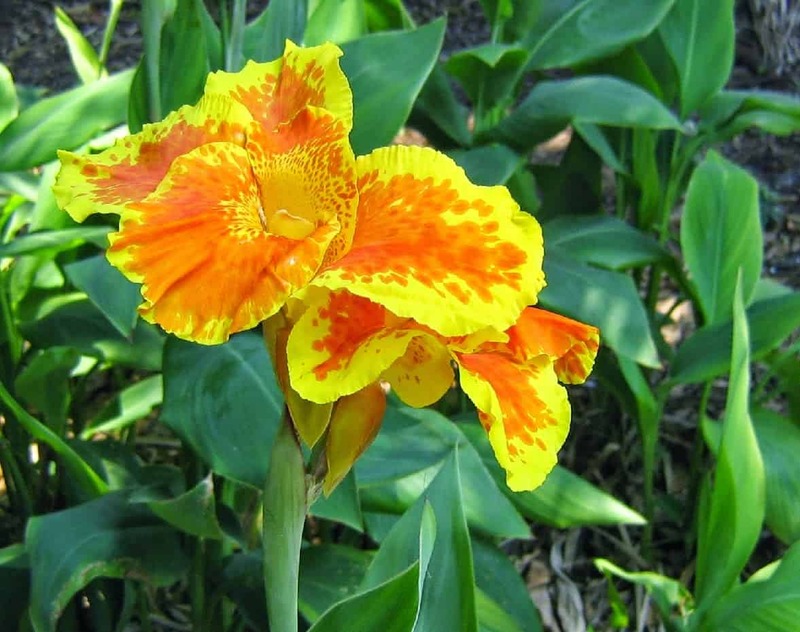 To rise up the sun impact during the summertime at your cute garden, highlighting this red-yellow lady called Canna is a must. The blossom coming with lengthy petals stands out among the dark green leaves. Native to the sweltering regions, Canna can’t be apart from the full sun. Yet, it doesn’t mean that the garden garnish hates a shady spot. Is it that hard to cultivate this gorgeous tropical perennial? The answer is absolutely not. Besides watching the right nourishment and moisture level, the yardman must anticipate the threatening pests. 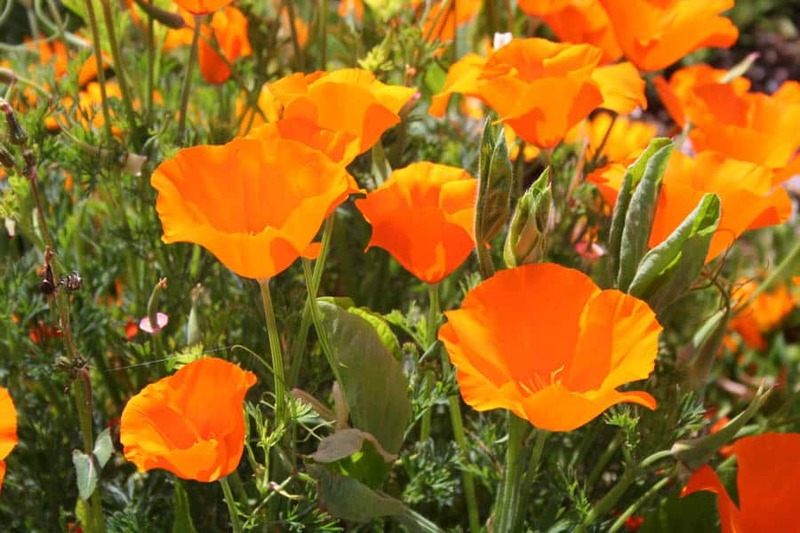 Belonging to the family of Papaveraceae, California Poppy is perfect to ornament your arid garden. The wild shrub mostly inhabits the mainland of the United States and Mexico. The silky-textured blossom has yellow and orange petals and elongated woody stems. And its leaves with lobed segments are crowded with bluish green shade. The best period to sow this annual plant’s seed and optimized the growth is in summer. Mind that the greatest soil medium is the rocky ground with gritty sand. If you cherish a nature-themed garden, opting for green flowers to give rise to the impression is nothing yet remarkable. Some often interpret the lush blossoms with good fortune, health, resilience, and youth as well. They also bring out the freshness and renewal optimism, advisable for a recreational purpose. One of the outstanding elements for your floral decoration with green motive is to let the bells of Ireland pops against the other plants. The flower whose scientific name is Moluccela Laevis has a towering lush stem filled with groups of peppy apple-green bells. The character description is obviously unique and attractive. 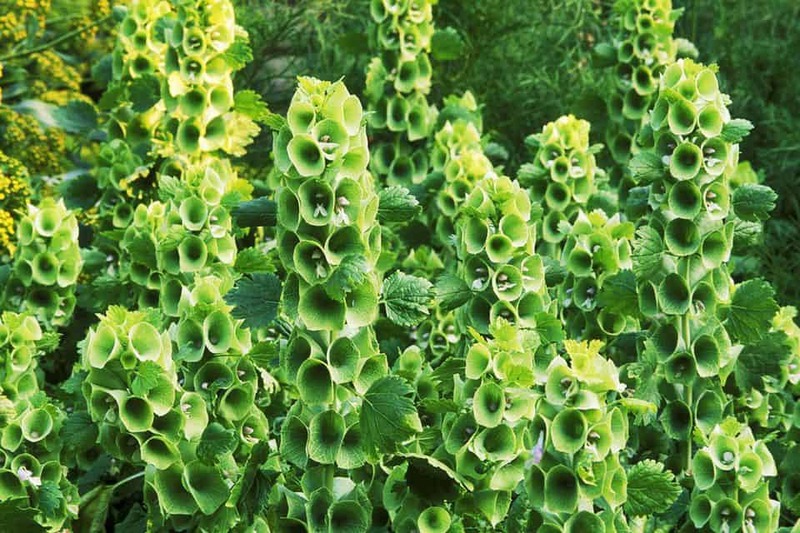 You will find the Bells of Ireland likable to many during summer and fall due to its unusual appearance. Still, you need to be careful with this fresh lady; its foliages are pretty prickly and irritating to your skin. 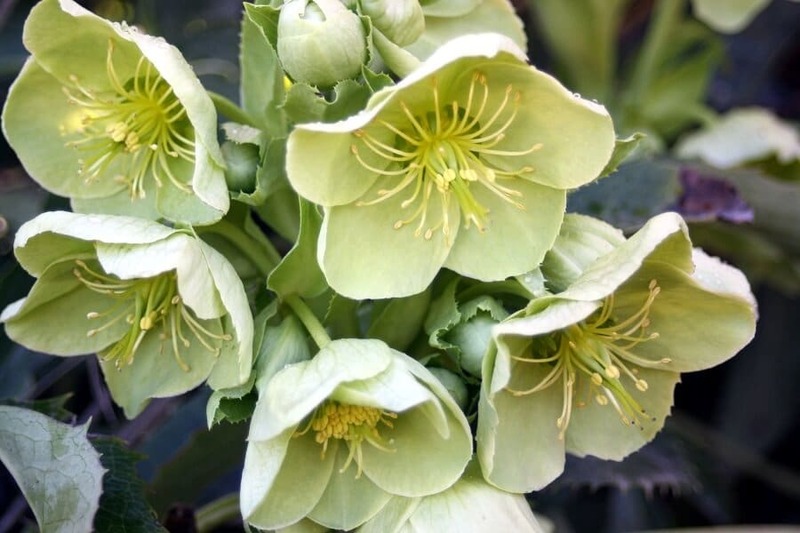 The bright greenish tinge flower popularly recognized as hellebores is worth to your little paradise in the backyard when the early spring comes. Originating from Europe and Asia, this delightful shrub with evergreen foliages has a bunch of names such as Christmas rose and Lenten rose – the label has no relation with roses. Hellebores have a vast array of features you can’t disparage. Not only is it rabbit resistant but this is also cold-hardy and easy to cultivate. Do you like wearing a corsage? Don’t you notice that the accessory decoration is actually a green flower called cymbidium orchid or better known as boat orchid? It has green, reddish tinge petals which are very similar to a lip pattern and rounded sepals. The evergreen lady often spikes bloom once only in the early spring. 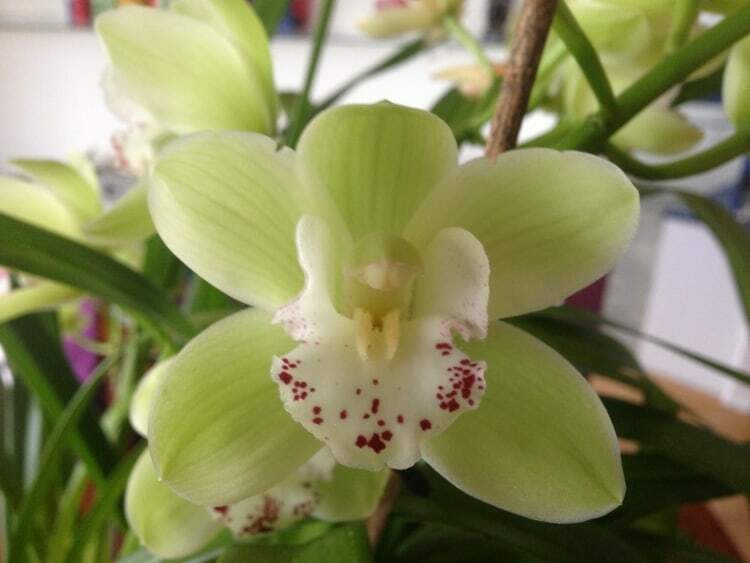 Cymbidium is famous for its ability to survive in both drier and chillier condition. For the finest growth, mind an area with mild temperature and adequate moisture. 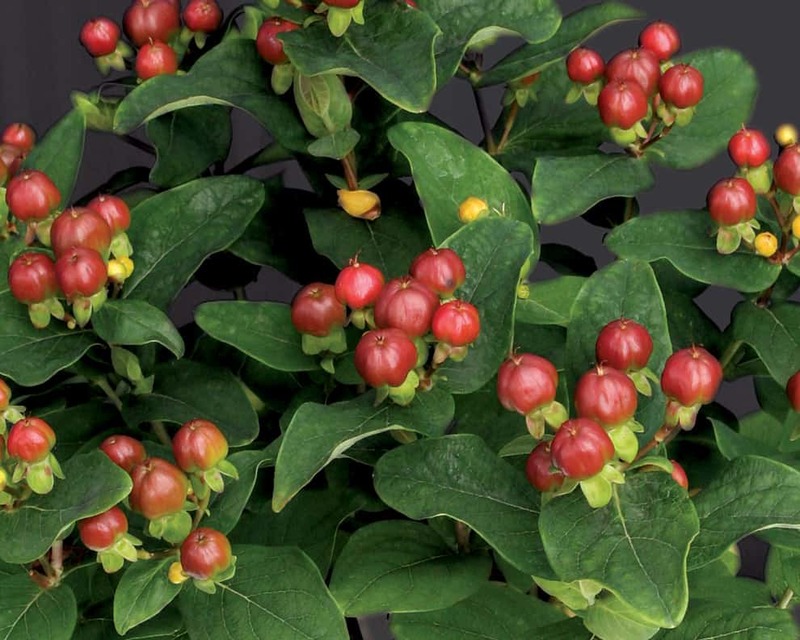 Hypericum Berries is typically a wild perennial shrub commonly known as tutsan or sweet-amber. The flower mostly found in the open woods of Eurasia indeed has an unusual appearance with 5 large greenish sepals and petals. Interestingly, the flower bud’s look is exactly tantamount to a purplish bush berry. It’s mind-blowing, isn’t it? While growing the sweet-amber, the gardener is recommended to care the environment with temperate atmosphere and moist soil. Although it’s incredibly cute, the perennial is poisonous to cattle. 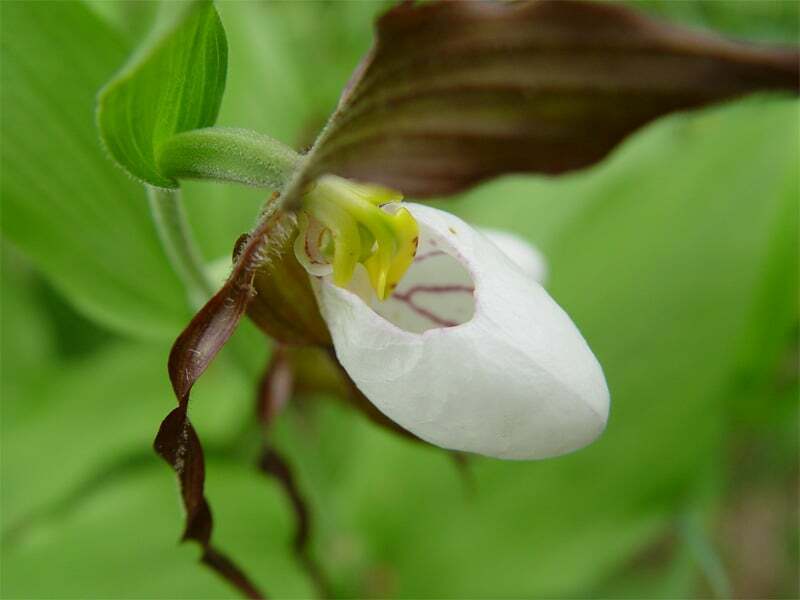 Having the lady’s slipper orchid feels like your home garden is full of good luck. The rare floral species originally from the semi-shaded woodland of Europe and Northern China never fails to impress people. It elegantly owns claret red petals with a hanging bright yellowish pouch. The name actually is inspired from the pocket akin to a slipper. The plant belonging to the family of Orchidaceae has a firm stem that only produces two blossoms. 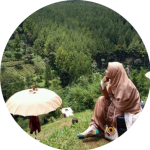 Unluckily, this graceful lady often suffers from the habitat destruction. 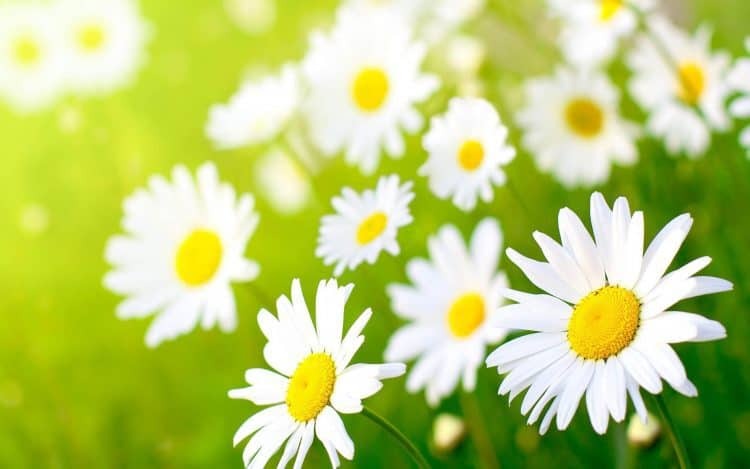 Because of numerous reasons and personal choice, some might not be fond of white flowers to be placed in a garden or a home space. On the other hand, you need to understand that these tranquilizing blossoms have multifarious symbols and meanings. Throughout the human civilization’s history, white flowers are consequential. The universal significations include purity (sin clearance), cleanliness and sterility, inspiration, and belief. 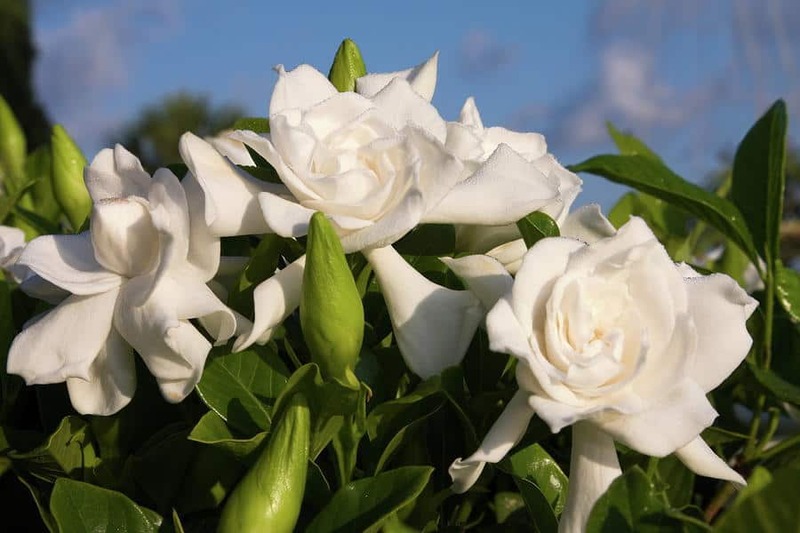 Elegance, pure, and soothing are the best words describing Gardenia, a creamy white blossom with tipsy smelling. The evergreen shrub loving the year-round sun heat has sweet, delicate petals contrasting with the leathery leaves. Belonging to the family of Rubiaceae, the bleached flowers remain flawless for your tropical garden. To be successful during the cultivation, you should regard some requirements such as warm temperature from full sun to light shade and consistently moist soil. Calla Lily does match with any corners of your home, be it a deck or a patio. The pearly white trumpet-shaped flower adorned with a fluffy yellowish stalk similar to an index finger always gives a brilliant effect to the entire space. The lady, originating from South Africa and Malawi, also brings out the summer vibe once it bursts to bloom. 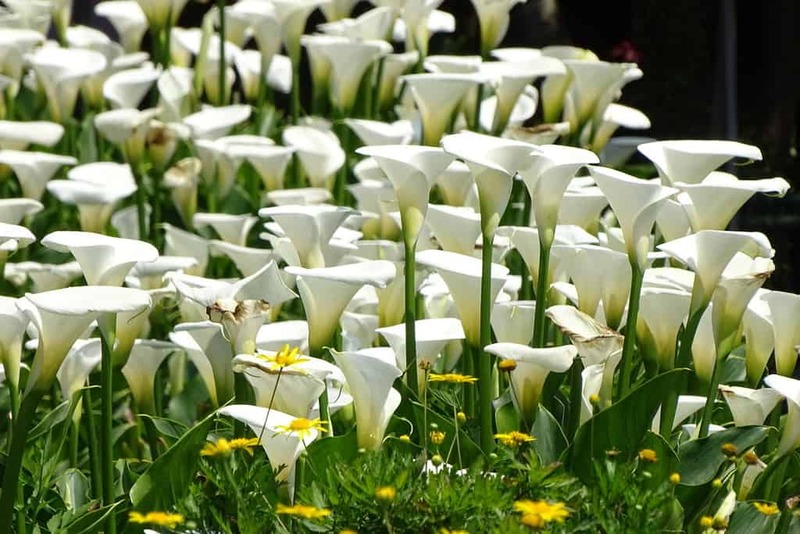 Calla Lily or known as Zantedeschia is best grown in spring. Do you live in a colder region? Don’t forget to keep the rhizome in a dry, frost-free spot before the planting season. The flower of Magnolia appears like a goddess radiating light spectrum. Although this striking perennial is considered as an endemic plant inhabiting the lowland of south Atlantic coastal plain – known as an area with a subtropical climate, it can thrive in a warmer area in the entire world. 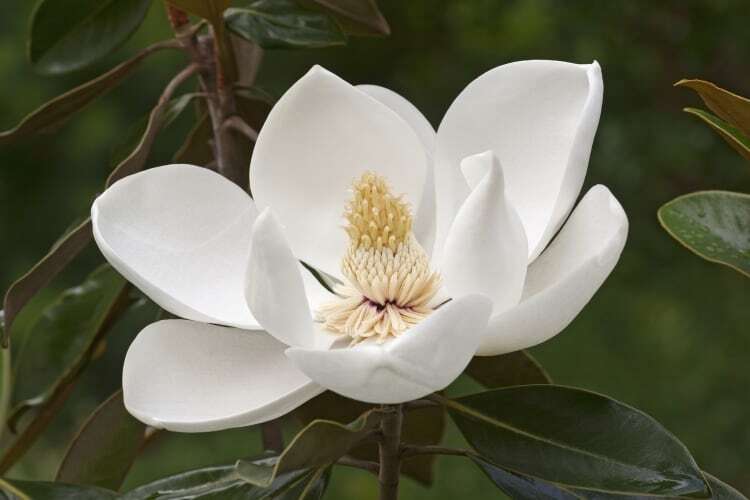 Apart from its dignified face, Magnolia grandiflora has a couple of waxy, white petals sitting on the tip of a twig. Interestingly, its scent is pretty citrusy. 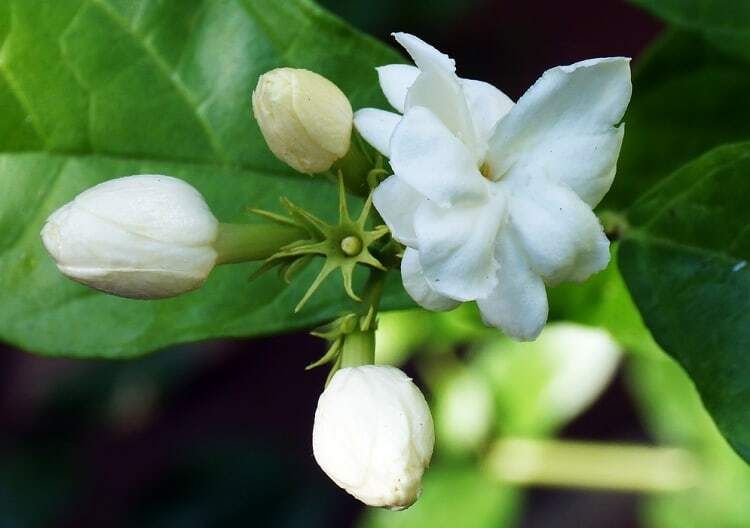 The flower adorers in the rest of the globe must be keen on identifying this tiny lady named Jasminum samba or better known as Arabian jasmine. The vine has a strong fragrance and graceful appearance. It’s no wonder; multitudinous cultures across Asia sanctify jasmine for certain symbolism in a wedding festival even a national flower. As long as the climate is humidly tropical, the evergreen shrub blooming all year round is able to survive. For great maintenance, be sure to water it regularly. 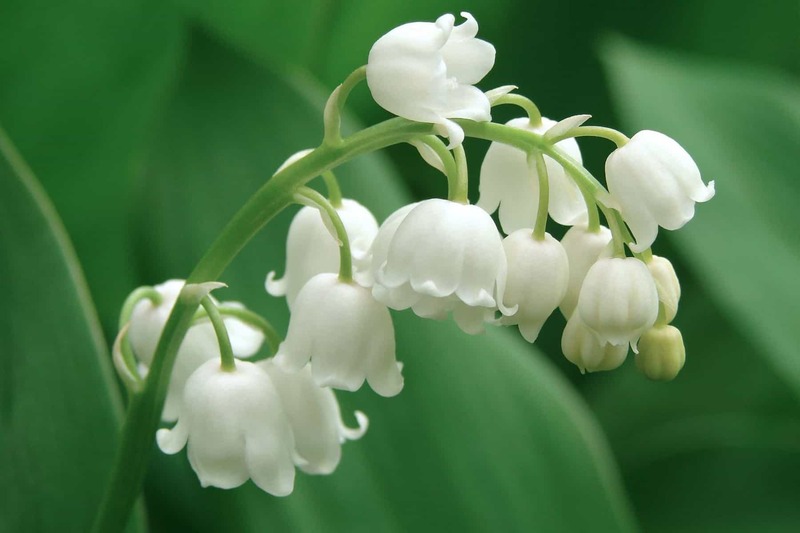 Lily of the valley has gained popularity not only for vase ornament but also for wedding bouquet in recent years. The national blossom of Finland from Asparagus family has spherical white petals, as well as two large, strong darkish green leaves. All the bush parts are supported by a thick, bristly stem with a purple base. The blooming process of this beautiful lady often takes place from May to June. It really is impeccable to brighten your late spring. Who can’t deny the elegance of pink flowers when Valentine day comes? The shade of pink bears a range of good essence especially for those who are falling in love with someone. Your romantic moment must be indefectible with the presence of them. They also have other symbolic meanings such as appreciation, admiration, and gratitude. 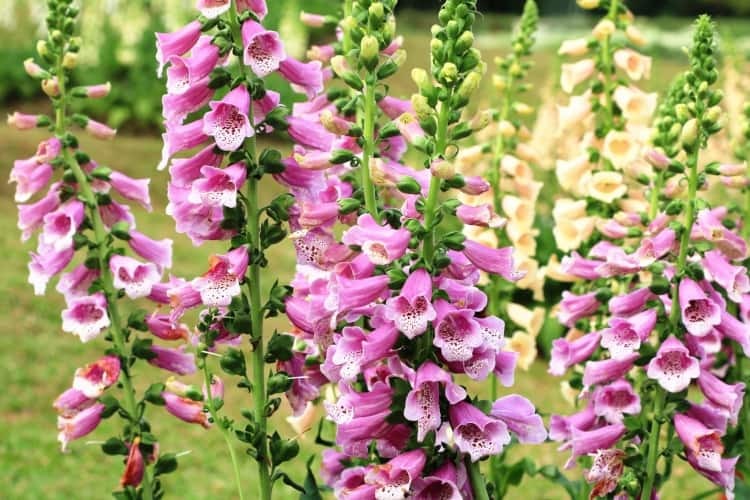 The genus of digitalis commonly defined as foxglove is undoubtedly great for your garden decoration pick. True to its name which means “finger-like”, this biennial plant owns an elongated, tubular flower fitted over a fingertip of the human. Surprisingly, it emerges from a tall spike. The vivid color of foxglove literally carries much joy. Despite its appealing look, it is poisonous causing vomiting and diarrhea. Phlox paniculata or simply called Phlox is pretty famous in the United States and eastern Canada. The herbaceous perennial has a bundle of small, bright pinkish flowers and modest leaves attached to a willowy green stem. At its natural habitat, this shrub lures butterflies to come. The best period to propagate this is between spring and autumn. Sadly, it’s prone to get infected by rust. 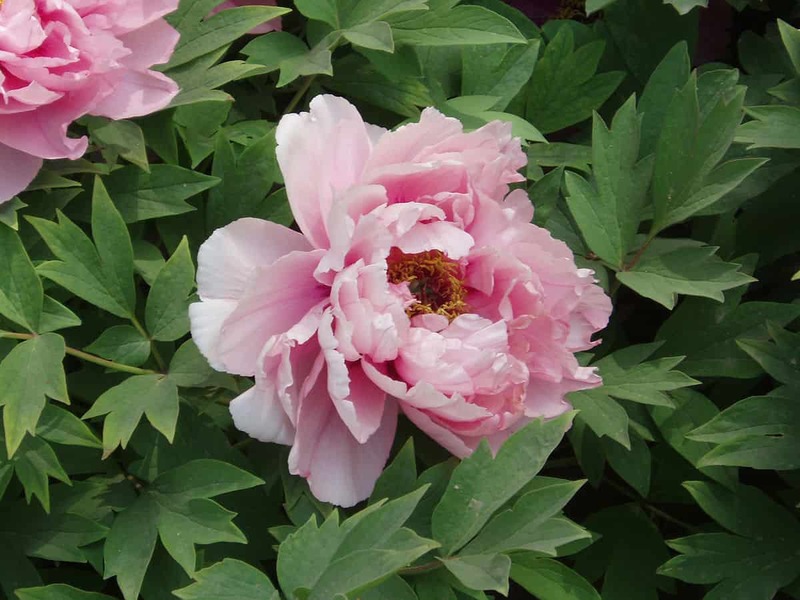 Peony is such a center stage of your home garden along the springtime. The bloom in contrast to the green foliage is outrageously picturesque. Homeowners would love to enjoy the flower’s scent fixing the gloomy mood. Arguably, among all of the pinkish flowers, Peony is poorest to be missed. This perennial grows very well in an area that is humus-rich, damp, and well-drained. 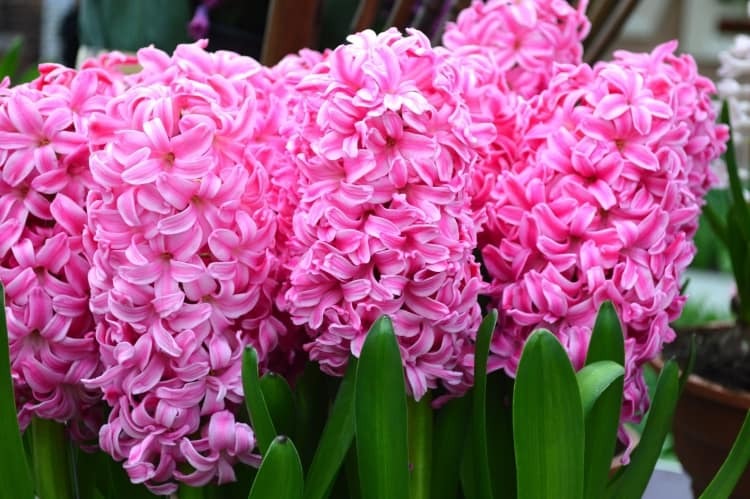 Hyacinth is one of the types of flowers belonging to the family of Asparagaceae. Originating from the eastern Mediterranean regions, this plant requires a subtropical climate, mostly cooler, to grow and develop. Its robust stem is crowded by a bunch of dense, bright roseate flowers. The lengthy linear leaves, as well as the spikes, uniquely come up from a bulb. The early impression of anyone seeing rose thrift must be no other than chic. 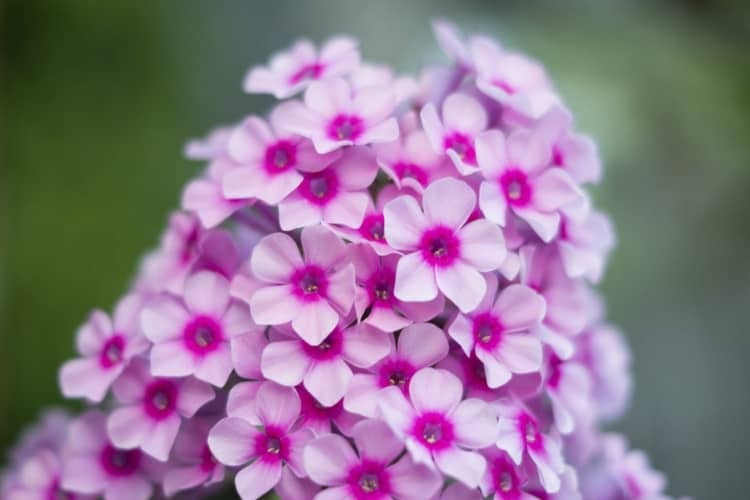 The evergreen perennial mostly grow in the mid-summer is jammed with clusters of tiny flowers of which shade ranges from white to pink and grass-like greenish leaves. 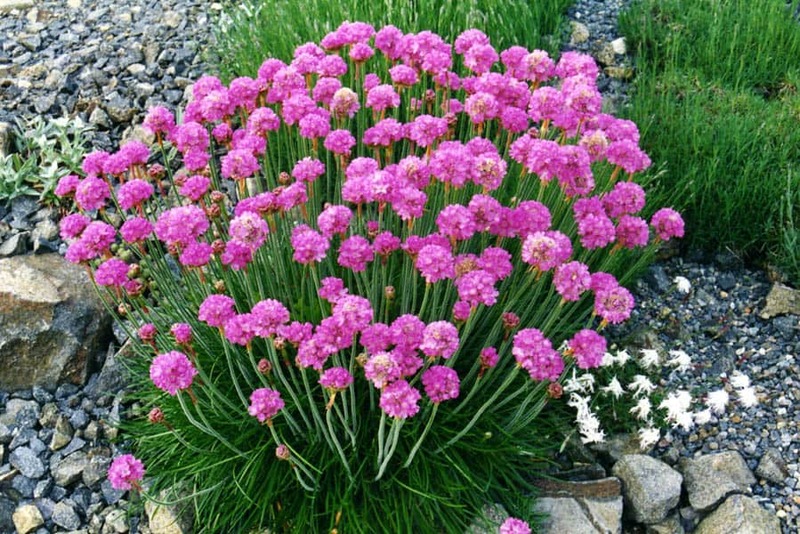 Rose thrift or Armeria maritime rosea is so fabulous for the edging and rock garden. Just like pink flowers, red flowers are capable of flaunting the strong emotion of love, perfect to be given for your better half. These types of blossoms are befitting your home areas from garden bed to patio. Besides representing a romantic indication, the deep meanings of flaming flowers can be respect, sympathy, heartfelt regret, and courage. 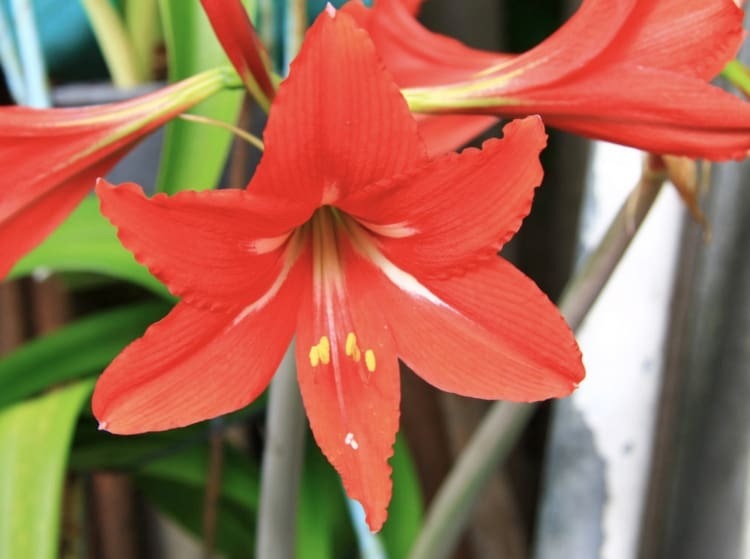 Adding hippeastrum or popularly known as amaryllis for your outdoor home decoration really is amazing. This elegant lady at the beginning used for festive gifts is famous for its substantial bulb. The exceptional part of it is the stalks rising out beautifully from the ground can produce a set of bright flowers. As it is native to dormant states, you don’t need to water the amaryllis too often. Just place the bold-colored blossom under full sun area. Out of variations of zinnia-type perennial, the zinnia elegans remains salient. The annual flowering plant, native to Mexico, has a solitary flower head caparisoned with multiple tiny, firm petals and surrounded by bright, yellowish florets. Meanwhile, the heavy darkish green leaves are just under it. Loamy soil with less moisture under warm temperature is the perfect medium for the flower to develop. You are able to grow the zinnia both outdoor and indoor. 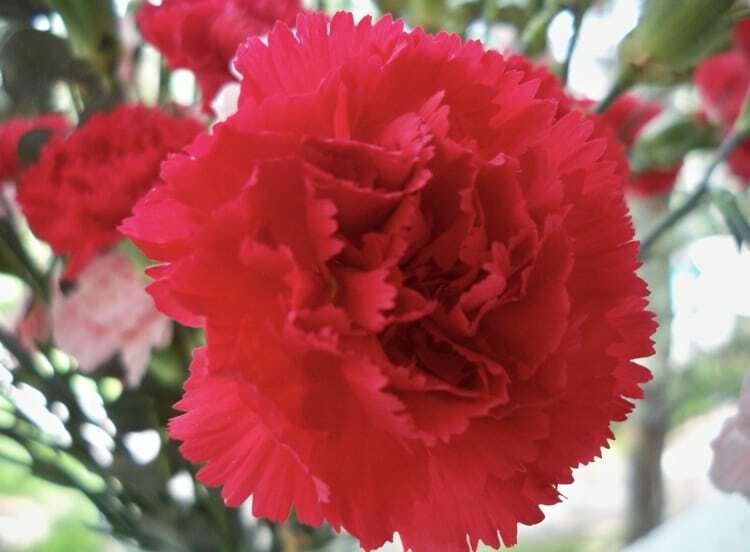 The red carnation is intimately related to the world’s human history. The surprising truth regarding the blushing lady is that many associates it with the symbol of labor movement and socialism. This charming plant has a sweetly-scented flower loaded with a bunch of skirt-like, blood-red petals and slender leaves. The dark red blossom representing affection thrives in a well-drained soil. With the regular care and maintenance, it always shines throughout the day. Whether red roses are the loyal companions for your sweet engagement moment or romantic dinner, their presence is always enticing. The bloodshot blossoms signifying romance have been cultivated for food, drink, and perfume for many decades. Don’t get shocked; they literally play a significant role in the human’s civilization. 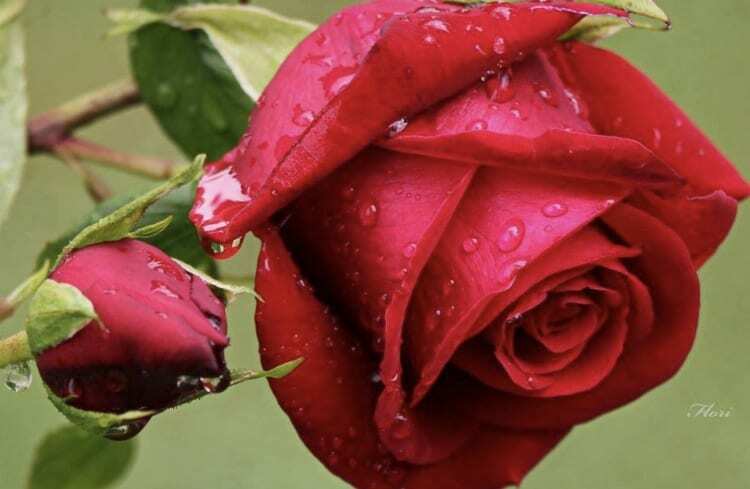 Without right care, red roses are subjected to harm caused by fungal pests as well as insect threat. Simply give the flower enough nourishment and water regularly. In comparison to the ordinary sunflower, red sunflower gives more dramatic effect to your garden space. 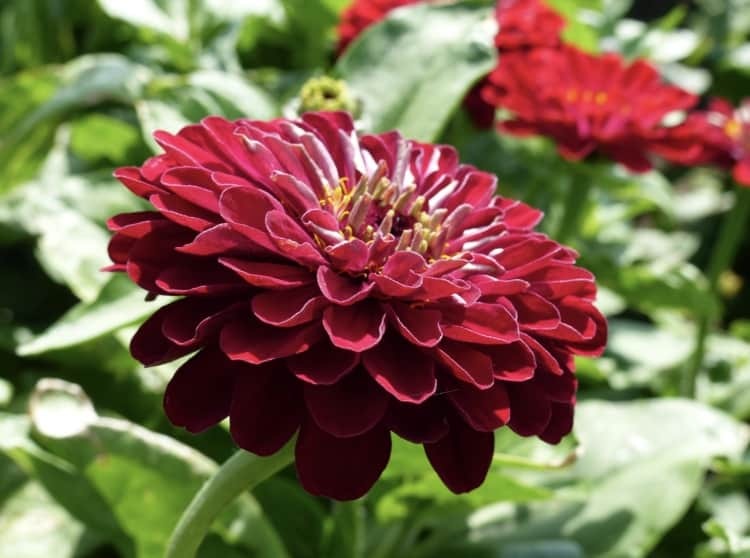 The unconventional variety has immense, red-blood petals and a black round flower head. Not only is it likable for children, but the adults won’t say no to this graceful sun-like floral species. 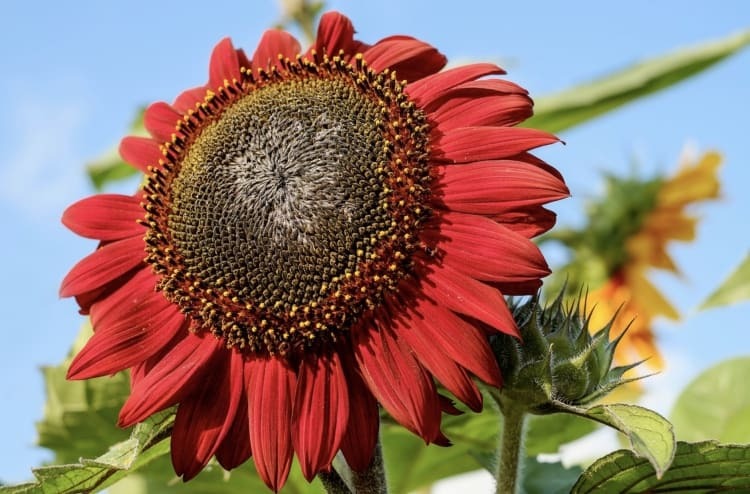 Red sunflower loves an area with a temperate climate and is tolerant to a partially shady spot. For the best growth, placing it under the direct sun is such amazing care. For garden enthusiasts loving to create a peaceful ambiance, enlivening the green space with a wide set of blue flowers is nothing yet excellent. In addition to reviving serenity and calm, these blossoms highlighting sea color denote a handful of meanings such as inspiration, hope, and desire. Their ultimate beauty does hypnotize anybody. 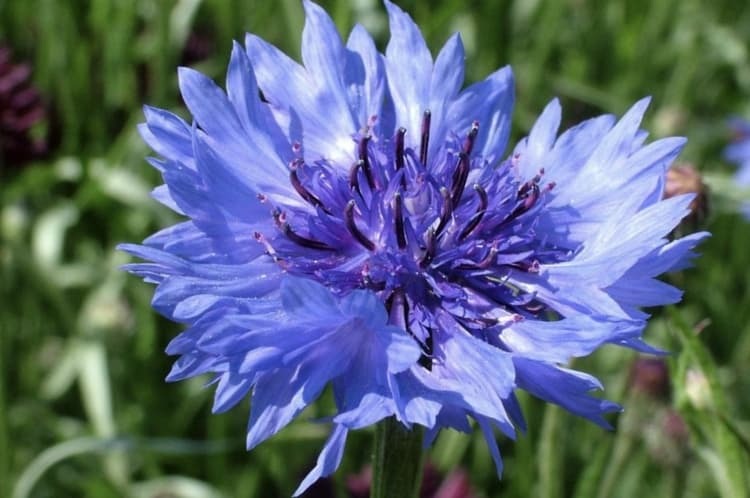 The floral variety of Centaurea cyanus comes with varied names from cornflower to bachelor’s button. 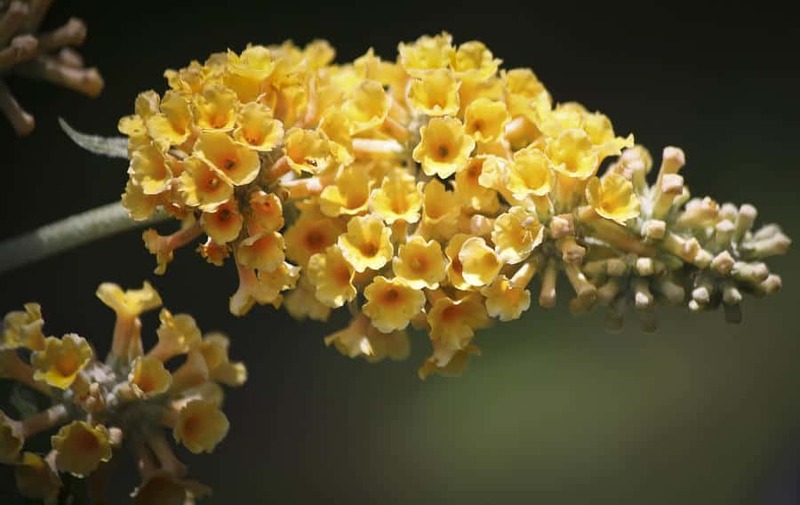 As a matter of fact, the blossom belonging to the family of Asteceraea has no corn appearance. In the past, it was often found in a cornfield as a weed. Hence, the old people named the plant that way. Cornflower gracefully has an indigo head emerging a cluster of disc florets. And it bursts to bloom merely in summer. “From adoration to devotion,” that’s a perfect utterance to show the elegance of a palatinate blue flower called globe thistle. The herbaceous flowering plant has a couple of spiny green leaves and an upright stem in which a spherical flower head with sweet shade sits exquisitely. It’s where a swarm of bees and butterflies usually hang out. 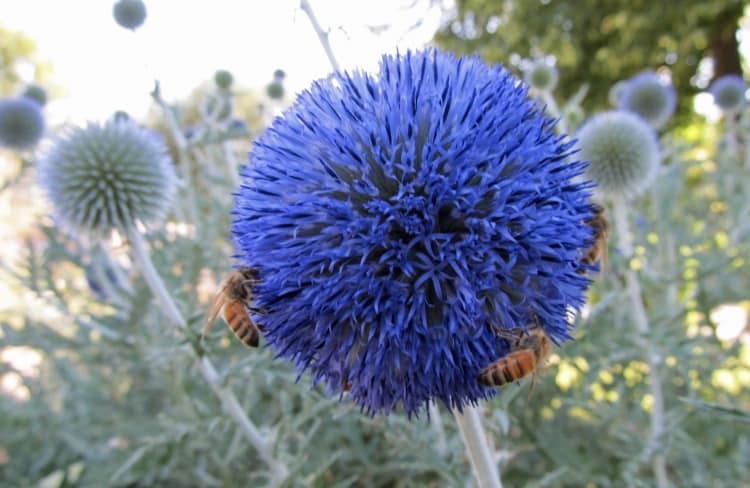 The specific features of globe thistle include deer-resistant, tolerant to dry environment, and not invasive. The bloom period ranges from mid-summer to early autumn. 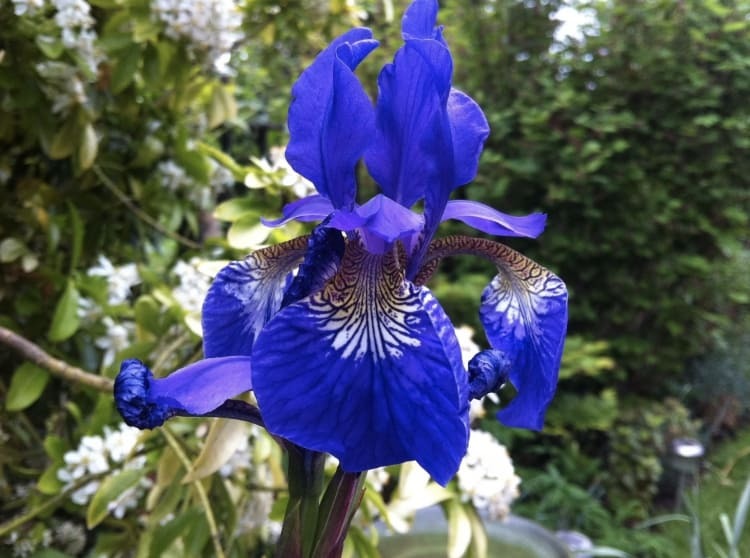 A haughty flower originating from Europe and Central Asia named Iris is awesome for your lawn decoration. 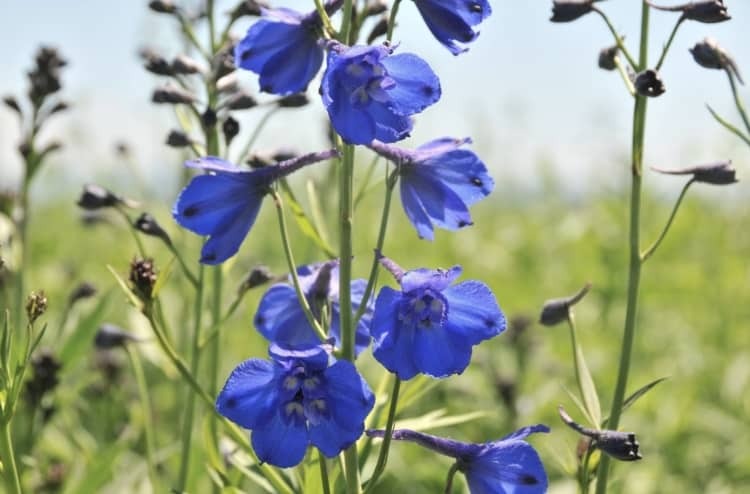 The rhizomatous perennial also known as Siberian flag incredibly has delicate, violet-blue, butterfly wing-like flowers and elongated grass-like leaves. The greenish parts of this plant uniquely own a pinkish tinge on the tip wowing anybody. Does this elegant Iris sibica require specific care? It actually depends. Yet the significant point is it is in need of clay soil with an acidic environment. The intense violet shade of blue delphiniums has heartily magnetized a number of avid gardeners to have this elegant lady. The wild perennial originally from the sub-tropical northern hemisphere is undeniably fitting for either cutting gardens or cottage-style gardens. When sunny summer arrives, this beauty of the blossom never disappoints. The best time to grow Delphinium is in summer. While preparing the gardening tools, be sure to mind the requirements including a shelter for wind anticipation and dry environment. 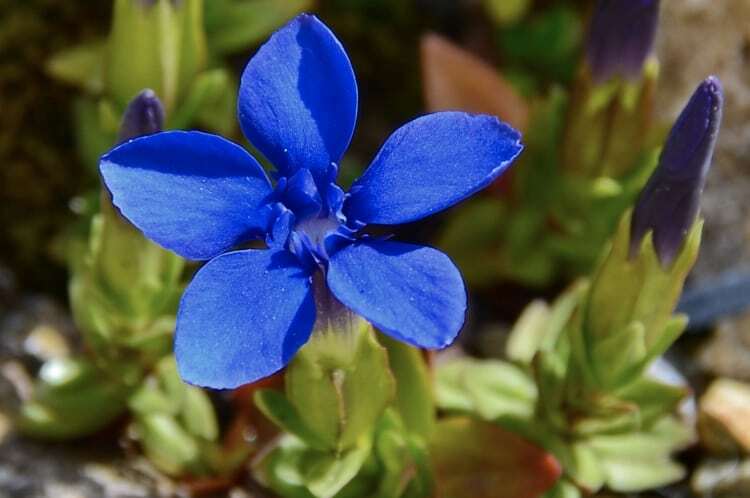 Another floral decoration compatible with your grassy lawn is the gentians or gentiana verna. Famous for its tiny size, this species is favored by a number of floret buffs. The beautiful grassy plant commonly inhabiting the Eurasian meadows interestingly has a short stem standing upright, lanceolate-like leaves, and a squid-like, violet flower. It needs a bit intricate preparation before planting this sweet flower. The right medium allowing it to grow well is comprised of limestone shatter, leaf mold, and clay mixture. In conclusion, it is not such a tough task to mix and match those mind-blowing types of flowers. With the flower decoration ideas described earlier, you have ample chance to build fashionable and catchy floral creation in your home and garden.